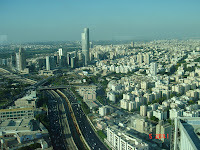 Recently, in the month of JuIy, I had an opportunity of visiting The Sheba Medical Center in Tel Aviv, Israel. It is the largest and most technologically comprehensive tertiary, university-affiliated, medical and research center hospital in Israel. It comprises of 120 departments and clinics, 1,700 beds, and close to 6,000 healthcare professionals, including 850 doctors and 2,000 nurses. The Department of Otolaryngology - Head and Neck Surgery at the Sheba Medical Center is one of the largest departments in Israel for the diagnosis and treatment of ear, nose and throat diseases. The department had a staff of 10 Israeli Board Certified staff physicians and 6 residents. The department is known for the rehabilitation of the hearing impaired children. They have a well developed Cochlear implant program, which has been going on for the past 18 years. The director of the department, Professor Kronenberg, is the inventor of the suprameatal surgical technique for cochlear implantation. It is a unique new technique, developed for cochlear implantation which bypasses the conventional route for cochlear implantation and makes the drilling of the mastoid (skull bone behind the ear) unnecessary. They have used this technique for over 200 patients in the past 10 years. It is the largest center in Israel for cochlear implantation with an overall experience of over 450 cochlear implant patients This technological breakthrough changes the life of children, enables them to develop, especially in the educational mainstream of modern life. The consultants in the department were very cooperative, always ready to share the views on the various otology surgeries being performed over there. I had the opportunity of sharing my experience in FESS and advanced endoscopic sinus surgeries as they have just started off with the advanced procedures like skullbase surgeries, DCR, etc. I also had the opportunity to move around and enjoy the living history of Jerusalem and Bethlehem ( now in Palestine) and the highly advanced city of Tel Aviv. On the whole, it was a good learning experience and I hope I use that for providing better healthcare to our patients.